If there’s one thing we know at Access Denied, it’s the importance of having access to car key replacement in St. Albans when you need it most. You can never know when you’re going to misplace a car key and therefore it’s vital that you have a team on hand to help in case of an emergency. Car keys are one of the most commonly misplaced items amongst men and women alike, which means it’s happened to most people at one point or another. If you find yourself without a car key and in need of car key replacement in St. Albans, contact us. At Access Denied, we work hard to provide a service that goes above and beyond what you would expect from a team of mobile locksmiths. Rather than simply offering a car key replacement service, we ensure we’re able to help with any form of car and key related problem. Whether you’ve locked the key inside the car or your key just simply won’t work, we’re on hand to help. As we offer a 24/7 service, we’re available at all times. This means there’s always a member of the Access Denied team who can help out when you need it most. We know that keys tend to go missing at the most inconvenient of times and therefore we’re on call for whenever disaster strikes. As well as being available 24 hours a day and 7 days a week to offer car key replacements and locksmith services, we’re also proud to be a completely mobile company. This means that everyone in the Access Denied team has mobile equipment and can attend callouts with ease. Instead of you worrying about how you’re going to get to us, we make the effort to get to you. Wherever you are, we’ll have you back on the road in no time. With so many different makes and models of car finding a car key replacement isn’t always straight forward, but with us this isn’t a problem. We stock parts for a wide variety of keys and we’re able to issue replacements for almost all vehicles. When you’re looking for an auto locksmith in St. Albans, it can be difficult to know what you should be looking for. Should you choose a company that offers the cheapest service or should you opt for someone who can complete the job in the quickest time? Should you choose the team that are nearest to your location or should you choose someone that throws in something extra? Well, when you choose Access Denied as your auto locksmith in St. Albans, you get all of that and more. Losing a car key or locking it inside the car isn’t an uncommon problem nor is finding yourself with a car key that doesn’t work or one that needs reprogramming, which is why we’ve been fortunate enough to work with a large number of customers over the years. Simply, at one point or another, most people need the assistance of a professional car locksmith. At Access Denied we understand the stress and worry that comes with being unable to use your car. Whether you need it to get to work or you need it to collect the kids from school, being without a car can put a huge strain on your day. That is why we work hard to ensure we’re able to provide an efficient service and incredible quotes, all from wherever you are. As we’re a mobile company, we’re able to travel to you to compete any auto locksmith services. So, as well as knowing the problem will be solved quickly and affordably, you don’t need to worry about leaving your location. Problems with your car’s lock and key don’t always happen during the day or at a convenient time, which is why we work 24 hours a day and 7 days a week. By doing so, we’re able to offer auto locksmith services whenever they’re needed. Even if you need help late at night or on an early Sunday morning, we can help. To find out more about auto locksmith services or any of the services we provide at Access Denied, get in touch. A member of the team is always on hand to answer customer questions. If you’re i need of a car locksmith in St. Alnbans, look no further than Access Denied. With a fantastic range of services and a dedication to customer service, we’re able to offer an unmatched service. Regardless of whether you’re in need of a simple new key cut or you’ve lost your existing key entirely, we’re able to help. 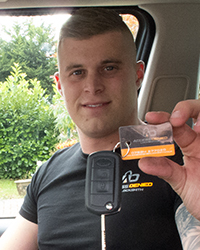 Through our years of working as a car locksmith in St. Albans, we have built up a reputation for providing an efficient and professional service; this is something that will continue. We understand the stress that being unable to use the car can cause, which is why we are dedicated to having the issue solved in no time. Misplacing keys is far too easy and most people do it at one point or another, but the problem comes when you don’t have a spare. Without a key, using the car is impossible and this can put a stop to any of your day’s plans. Losing car keys is a common problem and a lot of drivers do it, and sometimes the fault lies with a cheeky toddler who thought it would be a good idea to hide the keys only to forget where they are. Either way, help is available. Modern keys are a lot more complex than older car keys, which means a greater amount of expertise is required when it comes to replacing one or retrieving one from a locked car. That’s why it’s always a good idea to call in the experts; not only does this ensure no further damage is caused, but it also leaves you safe in the knowledge that a professional service has been carried out. At Access Denied we offer a constant service, meaning we’re able 24 hours a day and 7 days a week. We find that by working to this scheduled, we’re able to ensure we’re always around to assisted whenever you need us to. Whatever the problem may be, we’re only moments away. In fact, we always aim to reach our callouts within 30 minutes of receiving them. In the last decade, a great deal of thought has gone into how cars can be made more secure and experts have considered the different ways to ensure vehicle thefts and break ins are kept to a minimum. Though this has been possible and we’re now lucky enough to have cars that are relatively secure most of the time, this does mean that locking your keys inside of the car is a slightly bigger issue than it was previously. With state of the art locking systems, central locking and auto lock features it can be extremely difficult to retrieve a car key if it has been locked inside the car. Luckily, with the right equipment and training, car locksmiths like those at Access Denied are able to help with ease. It’s tempting to try and gain access to your car yourself and many people do attempt it, assuming it’ll save them the cost and time associated with calling out a professional locksmith. However, this rarely goes to plan and more often than not a lot of damage is done; this then results in a higher cost and still no key. Attempting to pick a car’s lock without the correct tools will cause lasting damage to the vehicle and may damage the lock completely, which is why we offer to do the job for you. If your keys are locked in your car in St. Albans, contact Access Denied. We have a fantastic team of trained locksmiths who are able to gain access to the car without causing any damage. Not only does this mean you get the key out but it also leaves your vehicle in the same condition it started in. Keys can become locked in a car at any time of day, which is why we offer a 24/7 service. Regardless of when you need our help, we’re available. All you need to do is give us a call and wait for us to get to you; this is usually within 30 minutes. To find out more about Access Denied or for help with keys locked in a car in St. Albans, get in touch. Tyler is a great bloke. He went the extra mile on our transit van. Also fault finding. The vans battery needs replacing. Cut us a key and programmed it. Very honest. Totally recommend. Thank you.if you need a van locksmith in St Albans Call Tyler.